BC iz nawt happi wif himz red shirt! O, noze !! 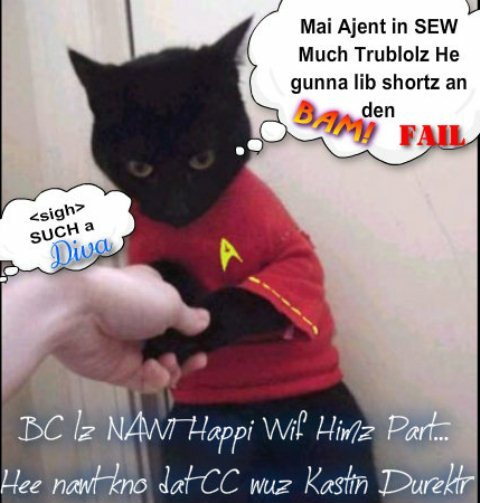 Kitteh haz a Star-Trek red-shirt … say it izzint sew !! he’s obveeusleh a bit over eggsited about tomorrows silly eneebreeashuns!!!! Silleh eneebreeashuns? Tomoro? Tel me moar! BC iz stukk inna tiyme warp aifinkso. Himz wuz sposta bee inna Rocky Horror Piktur Show? It’s an anonomaloly in teh spacetime continuinuinuinuum! Hey! Dats howz da Space Goggie gotted in da bush to scarez dat poor puppeh! Ai juss nao googloled William Shatner, who wuz Captain James T Kirk ov teh Starship Enterprise, tu find hims am 81 nd ai tihnk stil acting !! Red duzzint suit hims at all !! He wants the leed part! he want sto bee the Kaptin!!! oh nose! Scotty!!! I wasn’t ready!!!! hmm… this feels a bit straynj…. Walking on my hands could be interesting – but eeting with my feet? erm – could you put me froo the beem wunce moar? please? Tehre yoo am, Nenne !! Hoap yoo nawt dizzy !! Ai gotta choob uv soopergloo! Taht stuff can bi dayngeruss nd ai wudnut want enni mistakes awn mai hans !! Tiem Ai wuz owt uv heer! BBL, Bai!